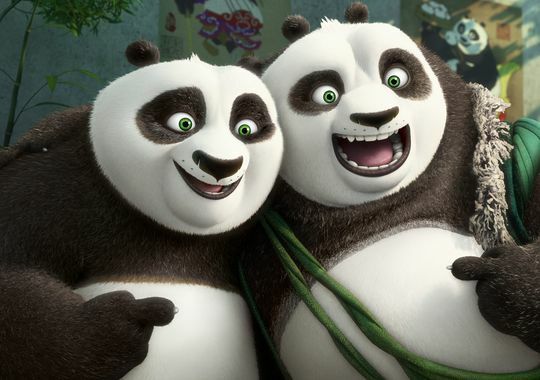 Kung Fu Panda 3 will feature, in addition to returning characters Po, the Furious Five, Master Shifu and Mr. Ping, Bryan Cranston as Po's biological father and Rebel Wilson as Mei Mei, another panda. In fact, the discovery of the panda village seems to be the main theme of the new movie. Other new actors with still unknown parts include the most recent Best Supporting Actor Oscar winner, J.K. Simmons, who everybody assumes is playing the villain after Mads Mikkelsen left the cast, which would make him the first villain in the movies with an American accent. 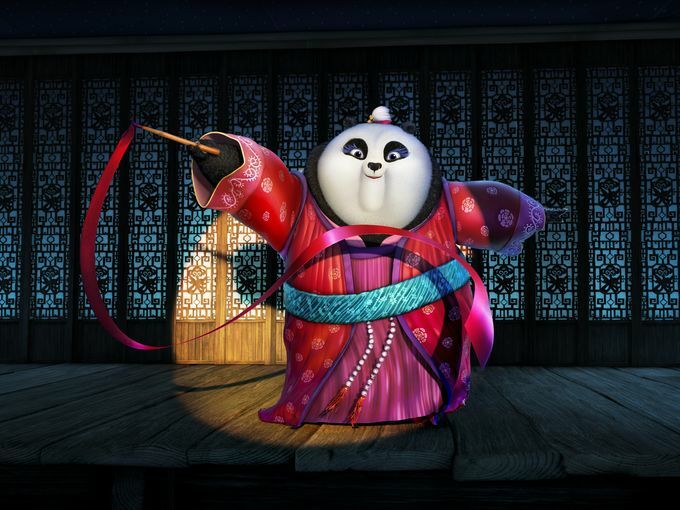 Po/Tigress shippers (which included the late, great Roger Ebert) shouldn't give up hope just yet with the announcement of a female panda; the USA Today article does describe Mei Mei as "amorous" and points out that Wilson wrote an in character love poem to Po, but also bluntly states "this does not turn out to be a panda love story." The furry wars hath begun! And 2017 won't be bad either: that one's Ponies vs. Raccoon with the Friendship is Magic movie and Guardians of the Galaxy 2. On that matchup I'd hate to say it but only furries would put a FiM movie on the same level as GotG. At least with Furtopia and Panda, it's Pixar and Dreamworks going toe to toe in probably a fight to the death over mainstream movie goers in Q1 2016. So the struggle would be seen outside the fandom as much as within it, and it's one furries will enjoy encouraging. Those two films may have comparable box office numbers. The MLP vs. Guardians not so much. Guardians is definitely going to come out on top. The target audience is much larger. On one hand, I was mainly thinking along the lines of, say, Ursa Majors. 2016 and 2017 are going to be interesting there (and 2016 isn't even strictly Zootopia versus KF3; Finding Dory makes this a three horse race with Sly Cooper being the dark horse candidate). On the other hand, I think you both overestimate GotG's box office clout (it was a hit, yes, but it was a surprise hit) and underestimate MLP:FiM's (animated movies have a lot of box office staying power, even if they don't instantly crush the box office). If the ponies get the right release date (or the "superhero bubble" that the first GotG was supposed to burst actually finally does burst), this could be more competitive than you think. And on the gripping hand, (which is a geeky reference that also happens to be very apt), I don't think that there's any way Rocket can compete with the ponies for the sheer amount of fan art (appropriate or not) produced. (I was just thinking the other day that I would be thankful for FiM for no other reason than the crapflood of pony art prevented a crapflood of Avatar art from sticking around). And what about European all-animal animated theatrical features? There’s the 2013 French “Loulou, l’incroyable secret” (“Wolfy, the Incredible Secret”), which was just on On Demand TV this year and had a don’t-blink-or-you’ll-miss-it U.S. theatrical release. It won the 2014 César Award (the French Oscar) for Best Animated Film of the previous year. Or the 2016 German “Ooops! Die Arche ist Weg…” (“Ooops! Noah is Gone…”), that refers to Noah but features only the animals? (I haven’t seen it yet; maybe Noah does appear onscreen at the end.) It has already had a British theatrical release this year as “Two by Two”, but nothing in America (despite most voices in this English-language dub having American accents). Watch both trailers. They’re different. Er – doesn’t making the pair trying to board the Ark a father & son rather than a breeding pair sort of defeat the purpose? I gotta be honest, not really liking Cranston doing the voice of Po's father. I would much prefer the guy who did the voice at the end of KFP2, it was short... but felt more appropriate for a cartoon, plus he has much more voice acting experience. Maybe I'm a bit pessimistic but bringing in name just feels like a cheap grab for star power and trying to bring in some BB fans. In general I think a lot of animated movies suffer a bit when they confuse great actor with great voice actor. Went to the theaters to see Spectre; they've got some decals up advertising Kung Fu Panda 3. Mostly pandas not Po, but Master Tigress was rocking some very odd robes.